Gary Schmidt put in his first race of the year following a winter tour in Germany. The result was stunning. He had a third place finish beaten only by Anna Gorbold and Anne Lambert. In all fairness the race was shortened and many of us reading our GPS weather app knew it was time to get off the water. We then repositioned ourselves at the pavilion to wait out the storm. We talked about drawing straws to see who would go back out to pick up the marks and decided they would be fine there until later. 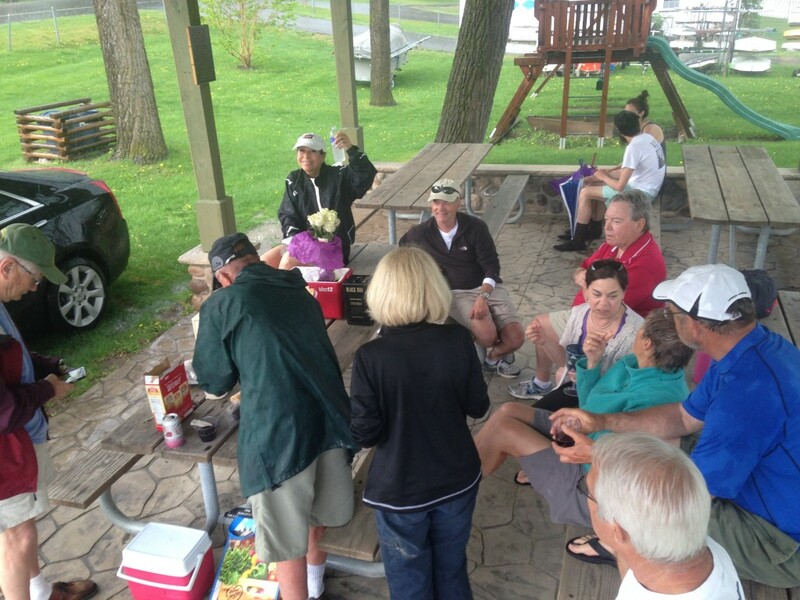 We did hold a fleet meeting where it was decided that plans should be made to hold our 5th annual Squaw Island Regatta on August 1st, the Atkins’ Hospitality Elimination Regatta on August 22, and an Erie Canal Race either the first or second week in October. There are still many fine points to be ironed out but I am confident that it will all come together. Stay tuned as there will be more info as things progress. Next week will be week 7 of our 8 week series and also the beginning of the club’s big boat racing season. I ask that we all be thoughtful of everyone’s needs to use the docks and not park vehicles in their way. Once again we will be on the south dock 4-6pm Sunday May 17th.